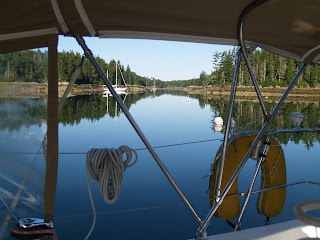 >On Sunday August 19th we left Pandora on a mooring near Southport Island just west of Booth Bay Harbor. Our friends Doug and Sharon have generously let us keep our boat on one of their moorings while we return to NJ for two weeks. They moved to Maine a few years ago trading the frantic life of corporate America for a wonderful home on the water in Maine. Doug operates Southport Island Marine, a boat building and service company located on Southport Island. 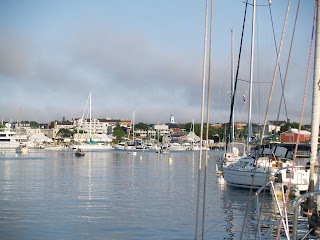 It’s hard to imagine how many wonderful harbors are crammed into Maine and it would be just about impossible to visit them all over many years of cruising. 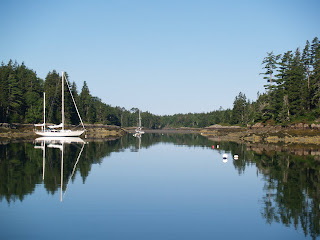 Here are some photos of just one more harbor just a few miles from where Doug and Sharon live. It’s called Oven Mouth and the currents run very hard. At peak they run about 6 knots, which means that you can’t really enter or leave against the tide in a sailboat. Entering Oven Mouth. It’s very narrow and deep. Very picturesque. When the tide is running there are whirlpools all over the place. Just across from where we picked up a mooring is property owned by our friends Chris and Pat. They purchased the lot years ago, put in a mooring and dock but haven’t yet put in a house. It’s no wonder that they love this place, it really spectacular. This is their dock. I guess that you have to put in a dock while you can. Saved seat! This is the view up the creek from Chris and Pat’s place. No wonder they plan to build a home here. The early morning mist was hard to capture in a photo. It was dead calm and VERY quiet. Perhaps too quiet for me. As you can see, Rip was really getting into the calm and zonked out in the dink. This summer he has gotten very used to being on the boat and just loves to SLEEP, SLEEP, SLEEP. Some local wild life, a great blue heron. It’s a big bird that stands over 3′ tall. Not the greatest photo as it was dusk when I took the shot. 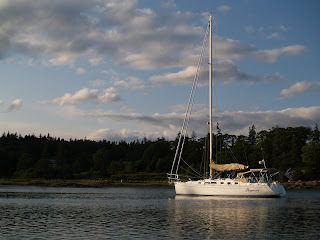 I went ashore to ask for permission to use a vacant mooring and met Chris and Pat’s next door neighbor Ed. I think that he’s mostly retired but has a lobster license and runs about 50 traps in his spare time. He says that lobstering “keeps me out on the water”. Makes sense to me. Ed was insistant that he make a lobster dinner for us but our schedule wasn’t quite flexible enough to stay another night. However!!! Ed’s offer is just too good to pass up so we hope to see him when we return next Friday to Maine and Pandora. Much of the area surrounding Oven Mouth is managed by the Nature Concervancy and we hope to make some time next weekend to check out the trails. This lovely bridge is part of the trail system croossing one of the inlets. It’s a really nice bridge. 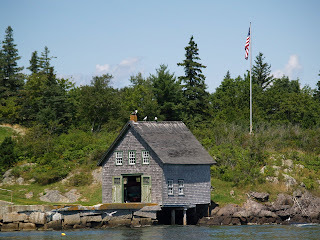 As a lunch stop on our way to leave Pandora on her mooring for a few weeks back in NJ, we stopped for lunch in Five Islands Harbor and the aptly named Five Islands Lobster Company. You can take out lunch and eat it on the dock. It was a really amazing day with lots of sun. A great way to end our trip. This photo (see Pandora just off the dock) really gives you an idea of the 9′ tides. That’s the dock where we ate. Amazing views! 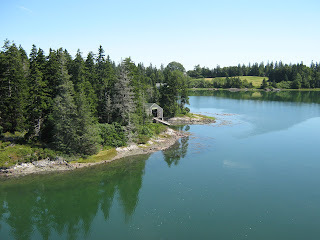 >One of our favorite things about Maine is the ability to slip into a narrow creek and be alone in the wilderness. Since leaving Rockland we have visited a number of great “gunk holes” including two of our favorites, both on the island of Vinalhaven. 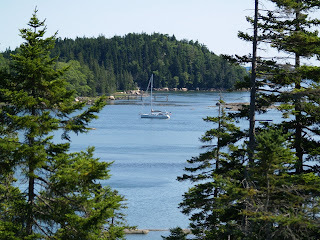 Our friends Keith and Rose aboard Camelot, another SAGA 43, told us about Perry Creek along the Fox Island Thoroughfare, one of the major East/West passages across Penobscot Bay. What a great place, and the land around it has been preserved by some local families as part of the Nature Conservancy. Only a few houses visible from the water. The view is spectacular. 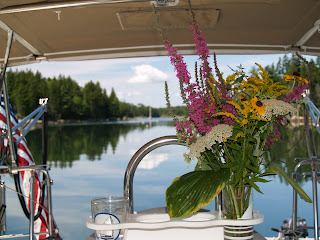 It’s always nice to have fresh flowers aboard. We actually have a “secure” vase down below so that the flowers don’t fly all over the place when we are under way. 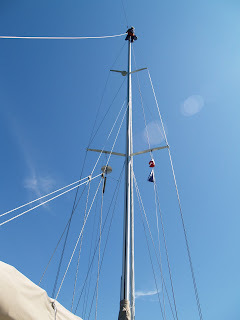 Here I am up the mast to fix the wind speed and direction indicator that had gotten a bit sticky and wasn’t properly registering low wind speeds. A trip up the mast to get the sender unit, a little WD40 and a toothbrush on the bearings, a trip back up to put it back and it was as good as new. 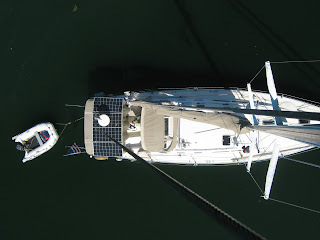 Fortunately, we have an electric winch that can pull me up the 63’ mast without any sweat. I also had to tend to a loose bulb in the anchor light that was refusing to cooperate. The bulb is a new LED that draws about 1/10th of the power of the old one. Most of the lights on Pandora have been replaced by LEDs, and now we can turn on most of the onboard lights in the evening and only pull a few amps, a massive change from the past. It’s a real plus as now the solar panels can keep up with our electric useage even if we don’t run the engine. That’s me way up there. Yes, it’s really high! The photo below is what I saw looking down. Notice the solar panels on the bimini. They are really great and supply most/all of the power that we need. You can see a long way from that high up. I prefer to not look down but somehow it’s less intimidating when viewed through a camera. Not!!! 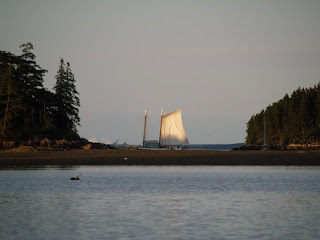 As I write this we are in Winter Harbor, a really narrow cut in the eastern coast of Vinalhaven where we anchored the other night following a visit to Burnt Coat Harbor on Swan’s Island. 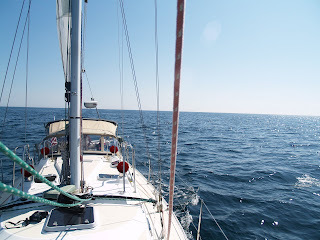 It’s about the narrowest place we go and not many boats come up this far as the channel winds around past some unmarked rocks that are right in the middle of the channel. This picture doesn’t show how narrow it really is as the tide is high covering all of the mud flats and rocks. I have been here many times and haven’t hit one yet. On this visit only one boat ventured further up the creek. As we came in we saw some seals and osprey. Later we saw an eagle too. Very remote and hardly a house to be seen. 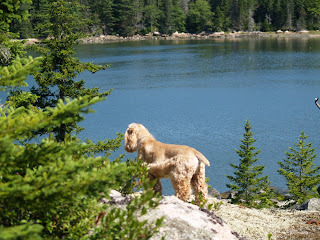 Our dog Rip appreciated the gently sloping granite ledges to get ashore without getting his feet dirty or wet to do his business. That’s a view of Pandora from on top of one big granite ledge. Rip surveying the scene. Master of all he can see? Perhaps not. 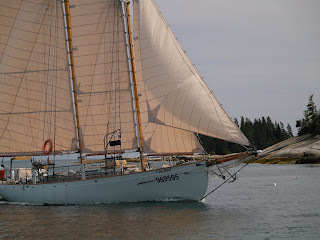 One of the schooners that takes groups out for week long cruises. Very picturesque. 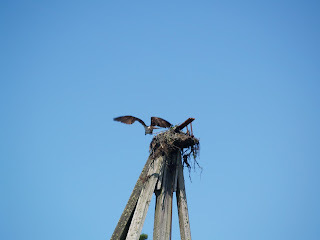 An osprey nesting on top of an old granite quary ruin. It’s fun to think about what life must have been out in these islands back when thousands of men (mostly) worked out in the islands cutting stone. Granite from this area was used to build the New York City Post office and many other buildings prior to the advent of concrete’s wide use as a structural building material. Pandora safely at anchor in Winter Cove. 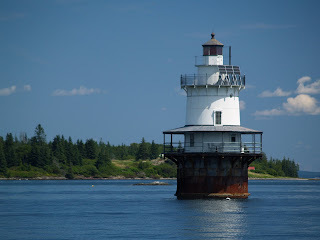 We are at the half way point for our cruise as of Saturday and plan to visit with some friends back in Rockland tonight and also plan on taking in the a show put on by magazine Maine Boats, Homes and Harbors. If you like Maine, you should subscribe to this magazine, I do. There are endless things to look at as you cruise the coast. Here’s a very nice boathouse we saw yesterday. We also see an endless series of great boats. Here’s a lovely schooner sailed by an “older” couple. I expect that he gets help keeping the varnish and paint up. Actually, an army of help is probably about right as it was in pristine condition. 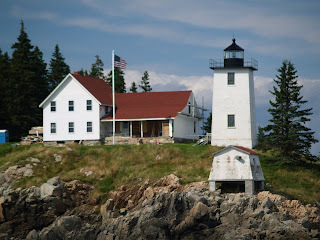 What’s a blog about Maine cruising without a few lighthouse photos. The one above is off of the entrance to Burnt Coat harbor on the southern end of Swan’s island. The one below is in Fox Island Throughfare. Many of these lights are privately maintained by a lighthouse society and a few are in private hands. There is a lot of support to keep them looking great so they will be around for years to come. 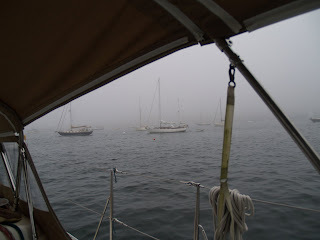 >We arrived in Rockland Maine on Sunday morning at 04:30 and picked up a mooring. 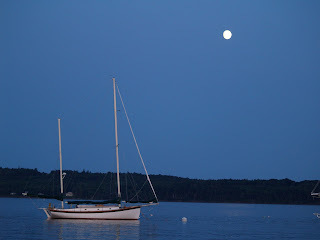 The crossing was uneventful with a nearly full moon to keep us company. The wind was very light out of the southwest so we ran the engine for the full 23 hours that it took us to make it to Rockland from Provincetown. There were seas of up to 8 feet but they were so gentle and far apart that you could hardly feel them unless you looked out on the horizon to see how much you were going up and down as they ran under the boat. There’s really nothing much to see except 360 degrees of horizon. You are really on your own out there. After the moon set it was amazing to see how bright the sky was with billions of stars so clearly visible. Pandora runs at night with no white lights at all so your eyes really adjust to the dark and you can see quite well. Down below we have red lights so it’s easy to find your way around in the “dark” but not disturb your night vision. These photos were all taken within a 12-18 hour period. Welcome to Maine where they say, “if you don’t like the weather, wait an hour”. So true. Here’s the same shot a few hours later. Near perfect visibility and very dry air. Wonderful! Not a bad sunset last night. And, the moon came up and is nearly full. Nice boat! I woke up really early today, Tuesday, at 04:00. Who knows why. Nice to watch the sunrise but that didn’t last long as the fog soon rolled in. Let’s see what it looks like an hour from now. Very excited as Brenda (and Rip) will be here this afternoon. Hope that they get up early too. As I write this we are about 40 miles out from the Cape Cod Canal. It’s a beautiful day with tremendous visibility. 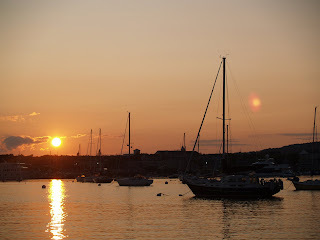 Yesterday, Friday we left from New Bedford and headed out. Unfortunately, the weather was really awful with a massive line of thunder storms headed our way. 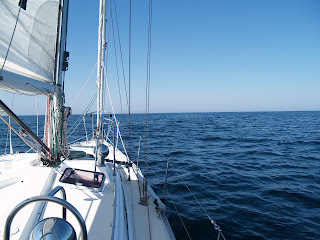 By 3pm we were nearly off of the tip of Cape Cod, Provincetown, MA with following seas building and about 30 knots of wind dead astearn, an uncomfortable and somewhat precarious point of sail under those conditions. The forecast called for more storms overnight so we decided to duck into Provincetown Harbor and wait for better weather on Saturday. This proved to be a good idea as the seas would have surely been worse the further off shore we got. Provincetown was as crazy as ever, a mix of families with strollers and guys in loin cloth’s, and nothing else, hawking their latest review. After some debate my delivery crew, Rodney, Burt and I opted for a seafood dinner instead of the “all naked male review” show. Sorry, no pictures of that, or the other wacky sights of Provincetown. What a difference a day makes. We left at first light and dropped the mooring at 05:30. Just after we cleared the end of the Cape, we spotted two large whales, probably finback basedon their size, spouting a few miles off. What a sight. I hope to see more as the day progresses. There is a very moderate wind but it’s just about on our nose so we are motoring with the mainsail up and making about 7kts over the bottom helped by a 1kt current as the boat speed is about 6.2kts. (A knot is about 1.1 statute mile per hour). Our course to Rockland Maine will place us over Stellwagen Bank, an area with a very large population of whales. On past trips, this is probably my 13th crossing, we have seen many whales and some have surfaced within a few hundred feet of the boat. It’s best to stay away from them but sometimes they come over to check us out and it’s amazing just how large they are. The computer says that we will be arriving in Rockland in about 19 hours which means that we will make our final approach in the dark and arrive as the sky just begins to brighten. I’d prefer to make landfall a bit later as there are a lot of obstructions along the way as we get closer inshore. However, with the radar and chart plotter we should be fine. It can’t be any worse than approaching in dense fog, something that I have done many times. 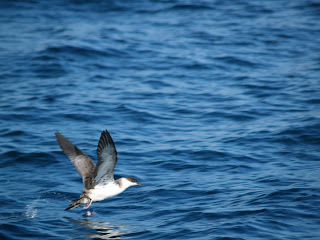 Here’s a shot of a Shearwater, one of the species of birds that live offshore all the time and only go ashore to bear their young. They are a fairly large bird with a wingspan greater than the largest shoreside gulls. Alas, no more wales for this crossing.